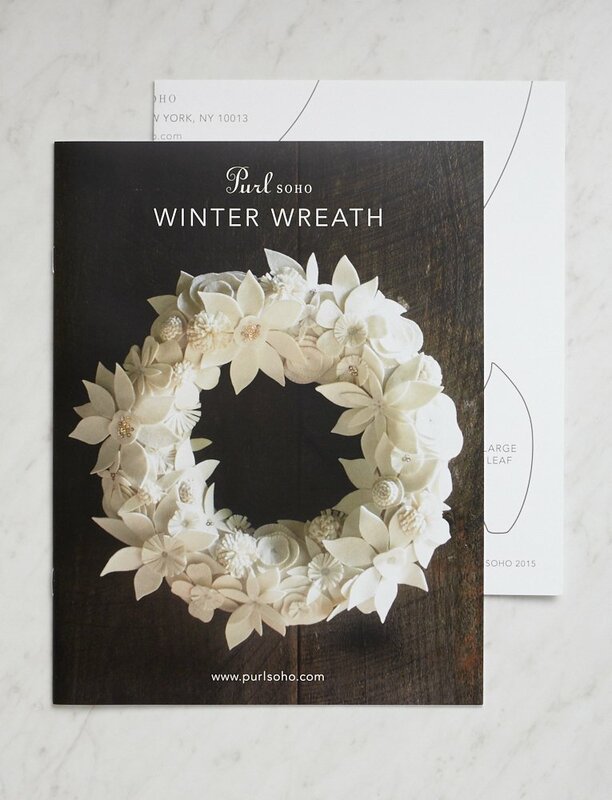 Purl Soho’s Winter Wreath is a bounty of artful flowers, designed to celebrate the holiday season and beyond! 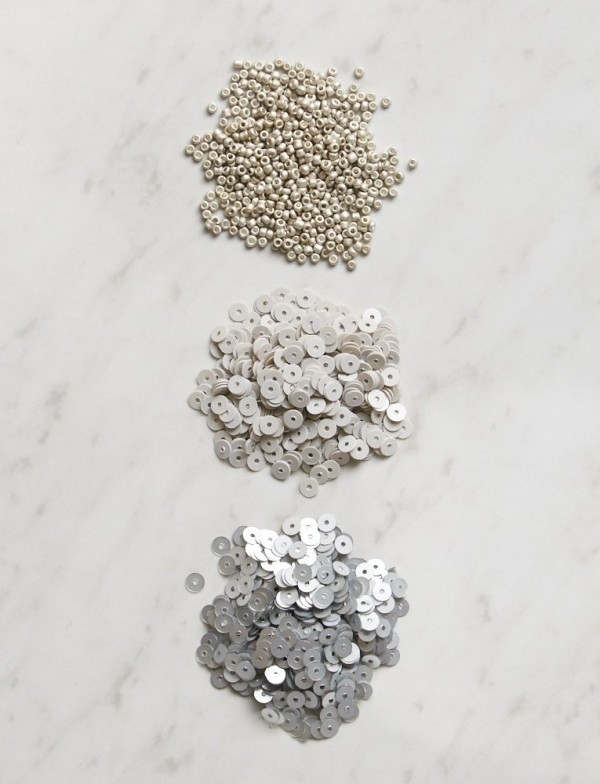 This year we introduce three new palettes to our collection: Pewter, Winter Sage, and Elderberry. Hushed in spirit, this year’s Kits are soft, understated, and very elegant. 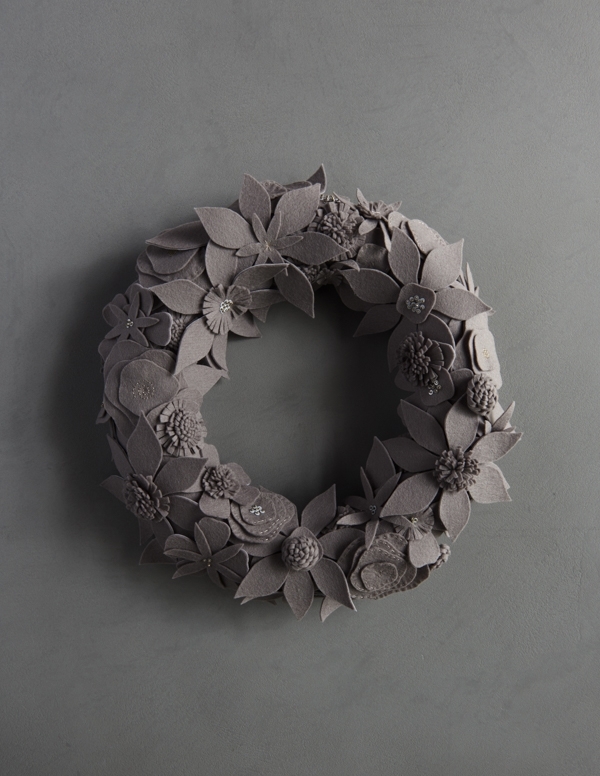 The Pewter Wreath reads like hand-cut tin or carefully crafted silver. 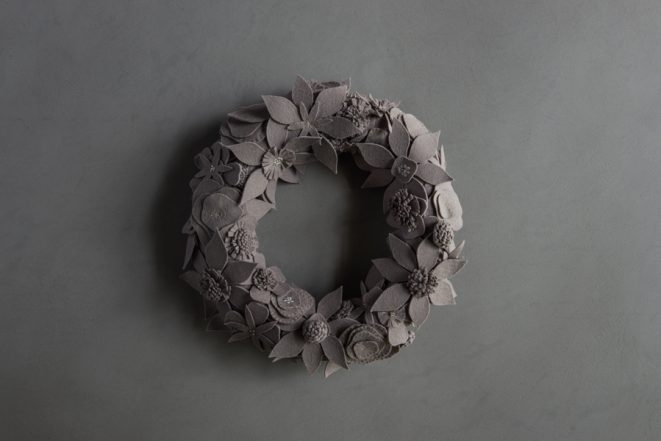 Like our original snowy White Wreath, its neutrality allows the texture of the wool felt and the embroidered details to whisper volumes. We love Pewter’s serious beauty! 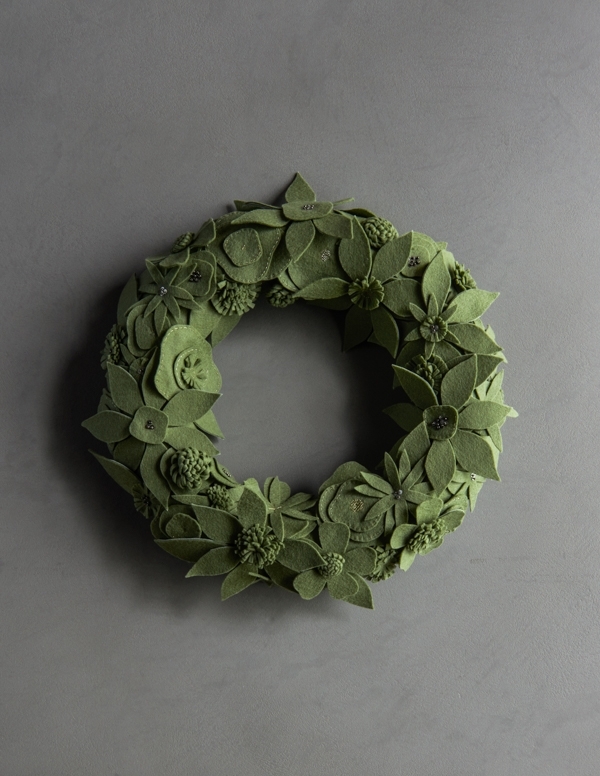 Our Winter Sage Wreath feels plucked from a luminous garden on the verge of winter sleep. It is a quiet, hibernal green, quite different from our more traditional deep Evergreen Wreath. And finally, our Elderberry Wreath glows from its hidden shadows. It is a profound mystery, resplendent in its sonorous tones. The Elderberry Wreath takes traditional Christmas red to new depths! To get started with your own Winter Wreath, pick up our Winter Wreath Kit in your favorite color. It has everything you need to hand-sew and embroider this very special holiday heirloom! The Winter Wreath Pattern is available separately, as either a hard copy or PDF download. 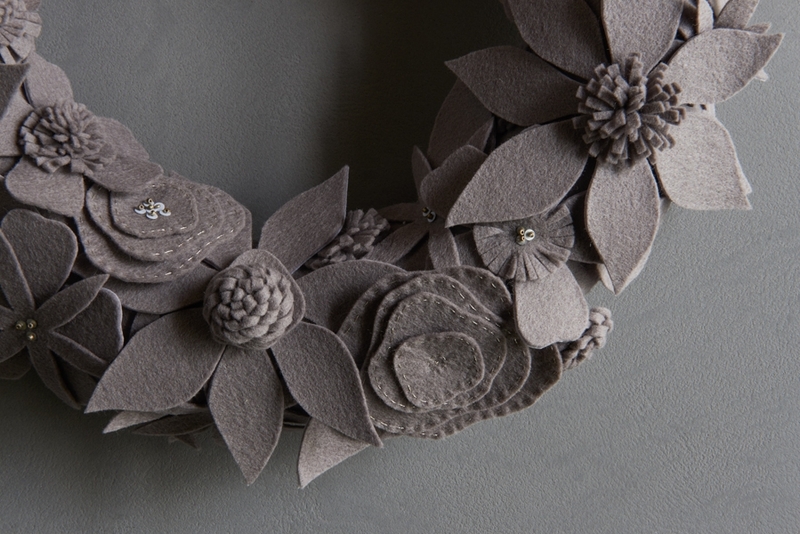 Wollfilz’s Wool Felt Pieces come in dozens of colors, so feel free to pick your own colors for a unique Winter Wreath! 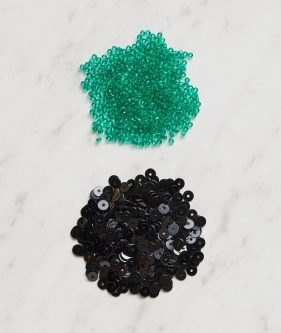 The same beads and sequins we used for our Kits are also available in separate bundles. 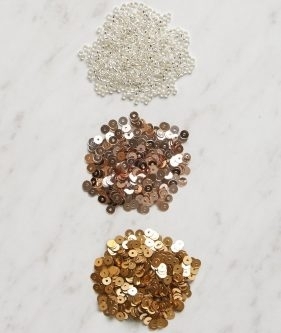 Above we show the Beads + Sequins for each Kit: on top, Pewter; and below, clockwise from the top left, Winter Sage, Evergreen, Elderberry, and White. Thanks for writing in! It is hard to estimate how long it would take to make this wreath as everyone works at different paces. Cutting out and prepping the project takes roughly between 2-4 hours. Depending on your speed, the assembling can take anywhere from several hours to 10 hours. These are just estimates and it make take you less or more time depending on your personal speed! Additionally, all the items that you need are included save for tools like scissors. 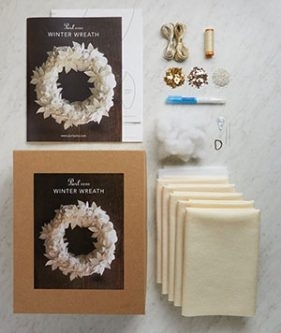 You will be creating the wreath form with the enclosed felt and stuffing. On a scale of 1 – 10 , what is the skill level needed to complete this project? Thank you so much for writing in! This project is great for beginners! 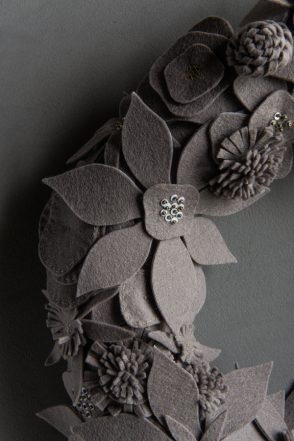 Anyone with basic crafting skills can make these, however, I do recommend allowing for plenty of time to complete this project just because there are several felt leaves and flowers to make. Please let us know if you have further questions and again, thank you for writing in! You should start a gallery for people to post pictures of their wreaths. I would love to see how everyone interprets the pattern. I am almost done with the wreath in white. Thanks for writing in! What a great idea! You can certainly add your finished project on Instagram and tag it with #purlsohobusyhands . 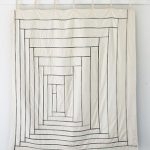 This is a great place to look at projects that others have completed and who knows, we may be able to share the finished project as well on our purlsohobusyhands Instagram account! 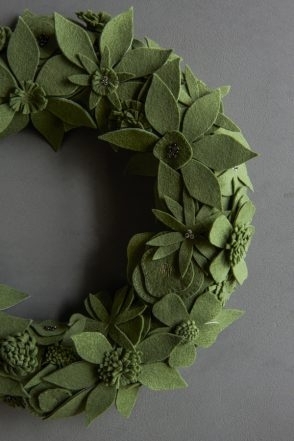 What skills do you need to make this wreath? Thank you for your interest in our Winter Wreaths! 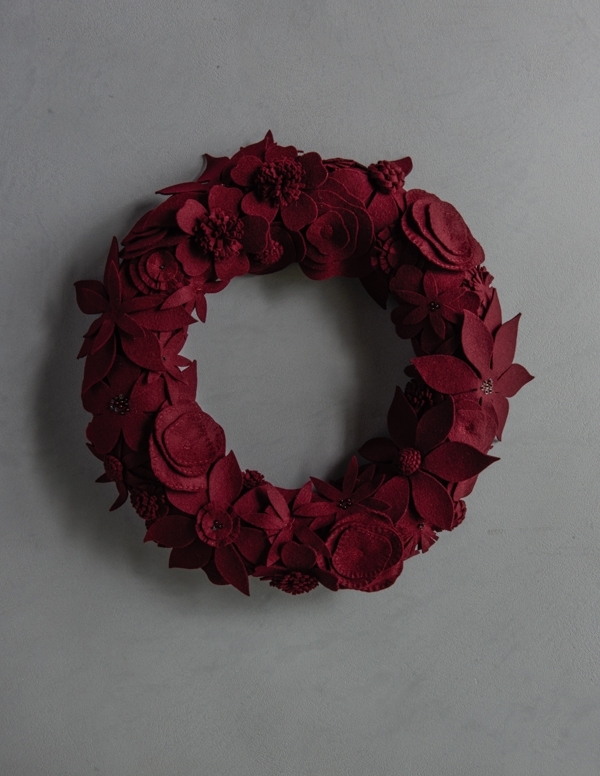 This project is quite simple and straight forward, anyone with basic crafting and sewing skills can make these wreaths. 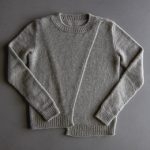 If you’re planning on making one for the upcoming holiday season I highly recommend giving yourself plenty of time to work on this – it’s an excellent project for a beginner but it can take a lot of time to create. Please let us know if you have further questions! Thank you for writing in! I already have this pattern, but I want to get some felt for it. Which felt was used for the Elderberry one — I don’t see “Elderberry” as one of the colors in the Wollfilz line, but I want to make one in this color for my step-mom. Thanks for the wonderful comment! 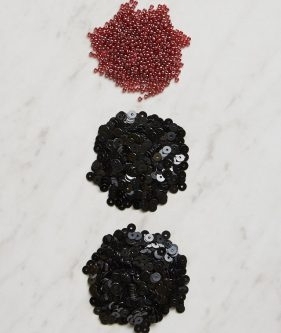 The color we use for “Elderberry” is “Grape” in the Woolfilz selection. Thanks! 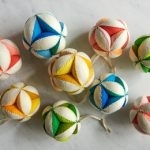 Are the shapes printed on the felt? If not how is the pattern transferred to the felt? I’ve sometimes draw shapes on butcher paper, then ironed that on the felt, cut the shape and remove the paper. That helps with dark colors, where a line from a pen won’t show. I’ m just wondering how it’s done with this kit. Thank you for writing in and for your question! 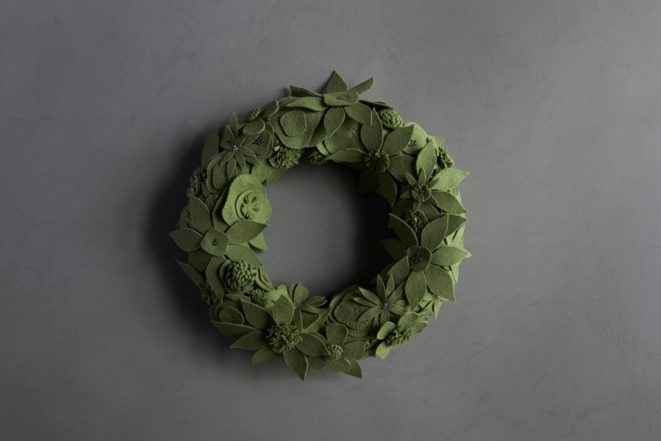 The pattern for this lovely wreath comes with templates for the flowers and leaves. You will need to cut out the templates for all the Flowers, Centers and Leaves. (Again, if your pattern is a download, first print out the templates.) You will then use the templates to cut out the shapes from the felt. If you purchase the kit, we include a Water Soluble Pencil that you can use to trace the templates. If I wish to purchase the pattern and felt separately, what is the color for the elderberry wreath? Or is that color only available in the kit? Thanks for writing in! The color that we used in this kit is Grape! Just made my first wreath and ready to make the next! 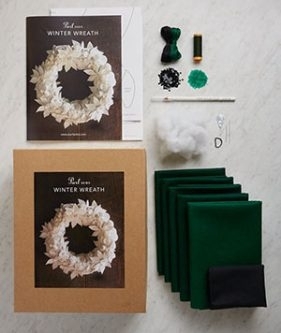 What colour felt is used in the white wreath? Congratulations on finishing your first wreath! 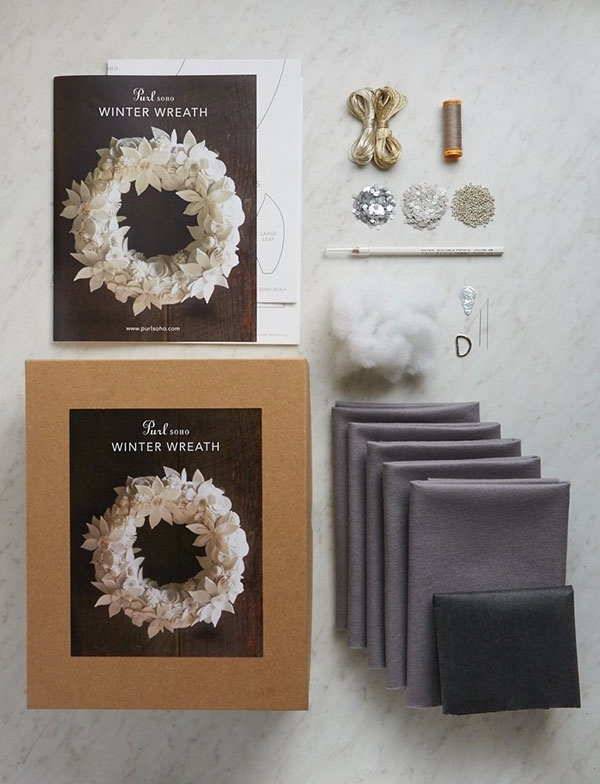 For the white winter wreath we used the Ecru color of the wool felt pieces. All of your things are so beautifully photographed! I have a question about this kit. It says that it comes with the stuffing to make the form – do you create the form from the felt and then sew that together? Thank you so much for your kind words! 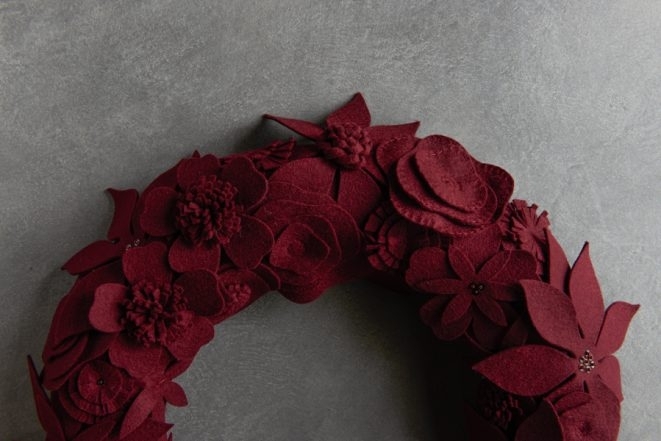 Yes, you do create the form yourself by cutting the pieces out of felt, sewing them and stuffing the wreath! Do you have any recommendations for the best scissors for cutting wool/felt? I would recommend the dressmakers shears by Gingher that we have. I use them to cut all types of fabric. The scissors cut very accurately and smoothly. Do I need a sewing machine for this project? It’s a beautiful, elegant wreath. Thank you for your question! 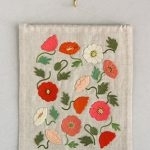 You can easily hand sew this project. I am in the process of making the winter wreath but I’m not clear on how many of the flowers and leaves I should use the interface on. Or am I interfacing just to provide a more stable template to cut out the rest of the flowers. Thanks for writing in! 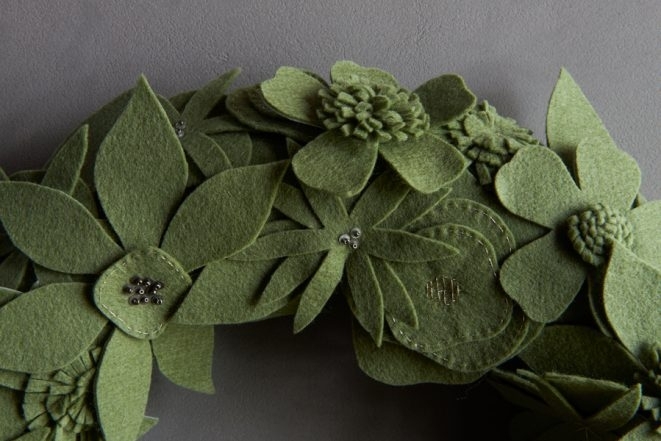 You will be cutting certain flowers and leaves from the felt prepared with the interfacing. These flowers and leaves are: poinsettia, wild rose, small leaf and large leaf. On page 3 of the pattern, there is a cutting guide for the flowers and leaves and the first section will show those that you cut from the felt with interfacing as well as the amount of each that you will cut! The interfacing on these pieces will give them a bit more stability! I’m putting the finishing touches on my first winter wreath and I’m already dreaming about a second. 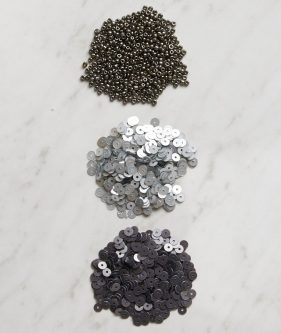 Since I already have the pattern I was hoping someone could tell me what color felt, sequins, beads, thead, and embroidery floss are used for the pewter wreath. Thank you! As well as the other materials listed above! Do you guys sell the pattern separately? I really want to make this this holiday, but you don’t have the color I want in stock. I was hoping you might sell the pattern, so I could buy the materials from you. Thank you for your interest in our pattern! We do sell the pattern separately, you can find it right here; . I ordered this kit and finally made this wreath. It took me about 24 hours, as I am not a skilled embroiderer. It was very rewarding to complete this project and it looks great hanging on my wall of my newly remodeled kitchen area. 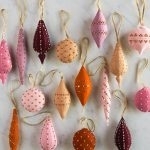 Merry Christmas, so love the store and the creative patterns. Finally got to visit last May….